Bonnie Mims at Peter Kehoe & Associates is offering the 36.5m Heesen motor yacht Sun Ark for charter over Thanksgiving, Christmas and New Year in the Caribbean. Sun Ark accommodates eight guests in a full width master suite with a king bed, two guest staterooms with queen beds and a fourth guest cabin with twin beds, all en-suite. Sun Ark has an extended bridge deck making this area over 35% larger than other luxury high-speed yachts of its size. This deck features built in seating with a table for alfresco dining, a full bar with seating, grill and a large eight person Jacuzzi. 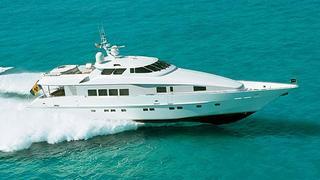 Sun Ark is available at a weekly rate of $75,000 during the holidays and $60,000 for the rest of the season.